The new California law in place giving Yelp permission to manipulate business ratings for money has a lot of people pissed. Some restaurants are fighting back, like San Francisco Italian restaurant Botto Bistro, who are now aiming for the lowest Yelp rating in the Bay Area. 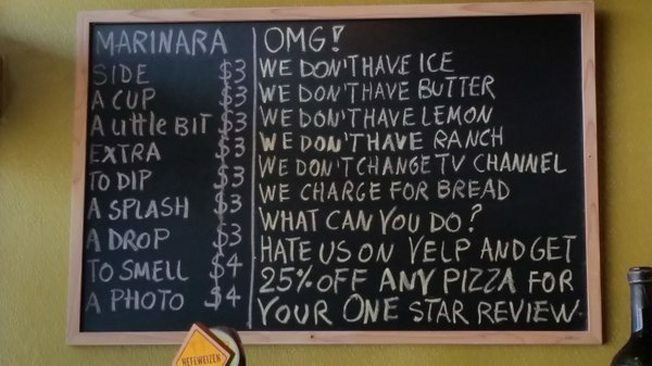 To achieve this, the restaurant is offering customers who write 1-star reviews on Yelp 25 percent off a pizza. 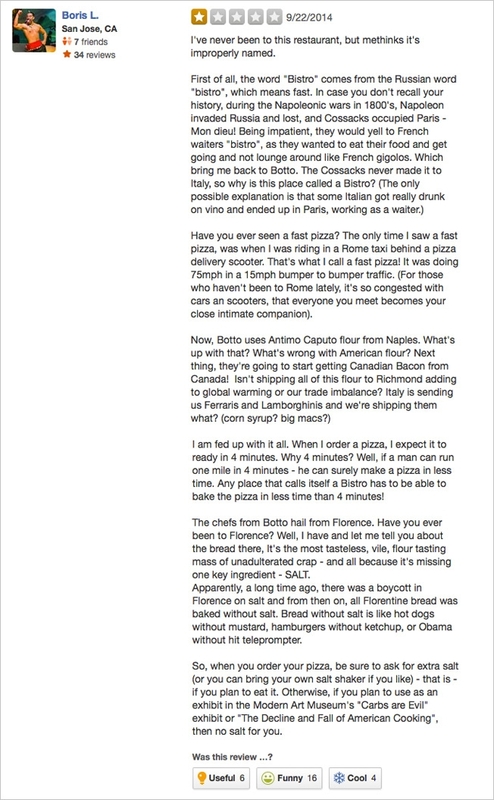 According to SFGate, owner Davide Cerrentini says it’s the best business move he’s made in years. He claims that Yelp would call him 20 times a week and hound him to advertise, a pitch he eventually submitted to, paying $270 for six months’ worth of advertising on the food review platform. However, once he stopped advertising, he saw his positive reviews vanish only to be replaced with mostly negative reviews. 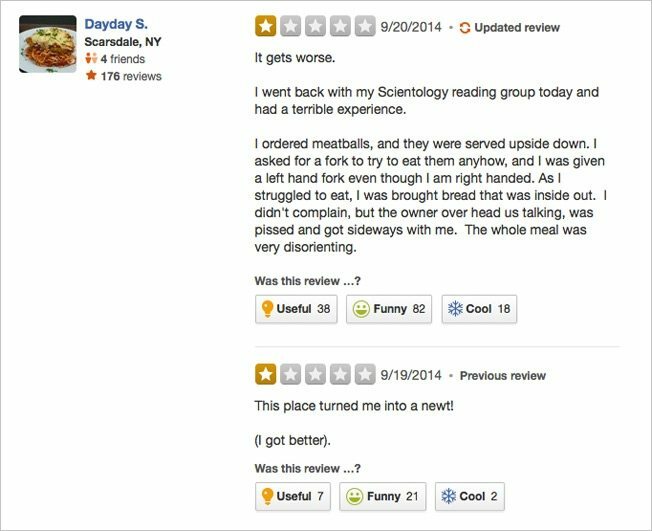 The campaign seems to be working, as there have been a flood of 1-star reviews on the restaurant’s page since they started their fight against the Yelp mafia. Some of the reviews are downright hilarious. Cerrentini has absolutely no regrets. “It was a great choice. We’ve had many years in this business. We’re Italian and we know what we’re doing. We are very much confident in what we’re doing. After 20 years, we have a huge following; we dont need to prove anything to anyone, including anyone who is writing on Yelp. He then went on and gave a warning to anyone who would take advantage of his business’s name online. “From now on, whoever uses my name or my business’s name to make money, if they put me up on any site with any profile of my business that I don’t want to be there, I’m going to sabotage it, make it miserable, so that it doesn’t mean anything to them. I should be the one that they pay to be there, not me paying them to advertise with them, to a site which to me is worthless. From now on, the music has changed. I am nobody; I own a hole in the wall in a strip mall in Richmond. It’s successful — it gives me enough — and my business is not gonna be blackmailed or extorted in a way that is convenient for them. Despite all this, Cerretini emphasizes that he is not angry. “I’m not angry. Actually, I owe them now. This kind of publicity is worth plenty thousands of dollars a year. I’m getting national TV, TV in italy, newspapers in Italy, Time magazine, USA Today, so imagine how much I care today what they’re gonna do with my stars. I mean, I’m getting so much business. And I’ll tell you what, the support that we have, we are so grateful to the whole world for, especially the American public. Cerretini shared his business philosophy. “If you open your business in your 20s, you approach the business in a different way. Along the way, you will experience different people and will make mistakes. So a younger chef or a younger restaurateur definitely should be more careful with what he does than the guy who is in the business for 50 years. 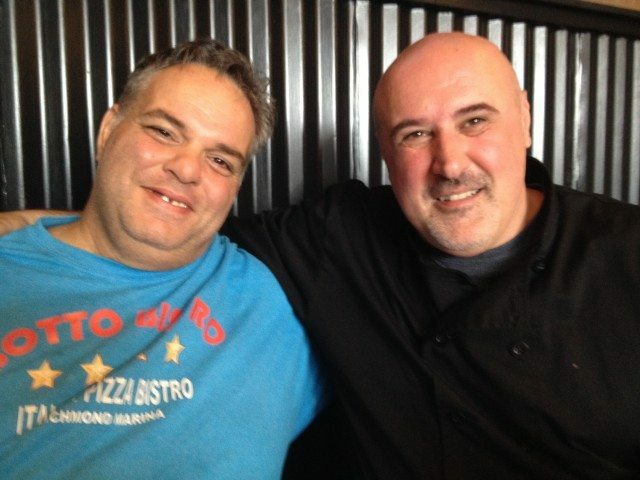 Me and my business partner reached the point, where five years ago, we opened our seventh restaurant — not together, but between us. We know what we’re doing. It’s not like trying to establish something. We didn’t do anything different; we just made it better. After 20 years in this business with a huge following, that tells you a lot. “The most important thing for me is to do something I love. Every time I cook a plate, it reminds me of my grandmother or grandfather, and I ate their food for like 20 years with that smell, with that texture. I can hear their voice when I eat the food, I can still hear their voice. Why should I consider the words of a nobody who writes two words in a Yelp review or any other site about what my food should be when they grew up on milkshakes and hot dogs? I’m sorry. I grew up with my grandfather eating healthy food and loving what I’m doing. Now go to Yelp and give this restaurant a 1-star review yourself!